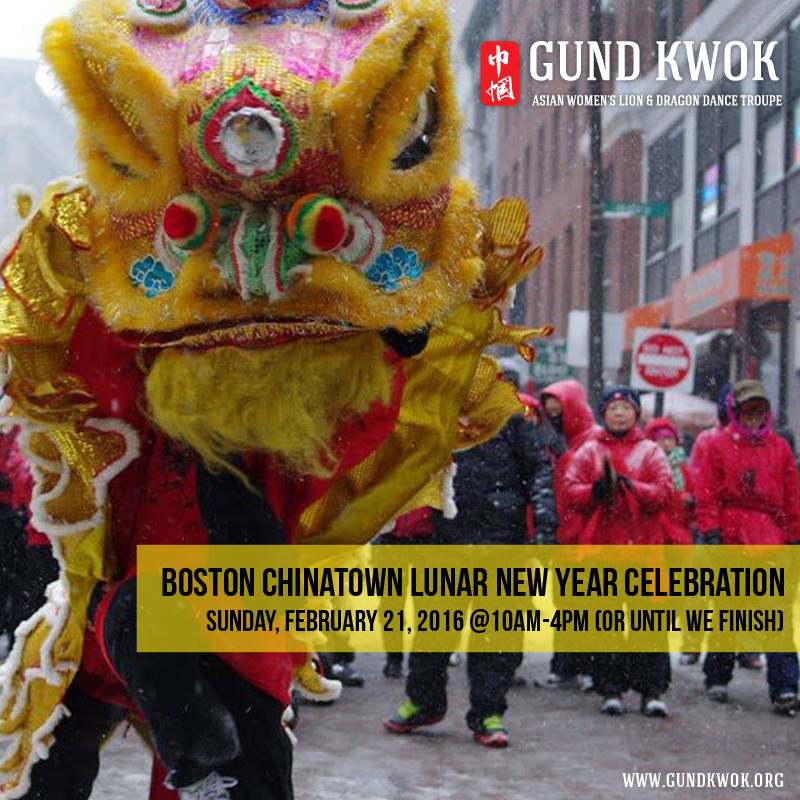 Come Celebrate with Us at Boston Chinatown Lunar New Year Lion Dance Parade! 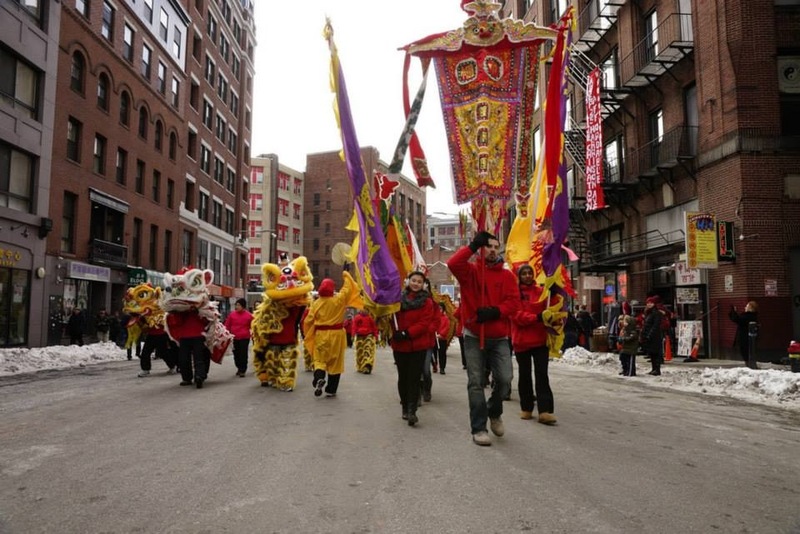 Celebrate the lunar new year in Boston Chinatown with us on Sunday, February 12th! GK will be blessing and sending good wishes to all the shops and restaurants. There will be a lot of oranges, lettuce…and maybe some firecrackers. 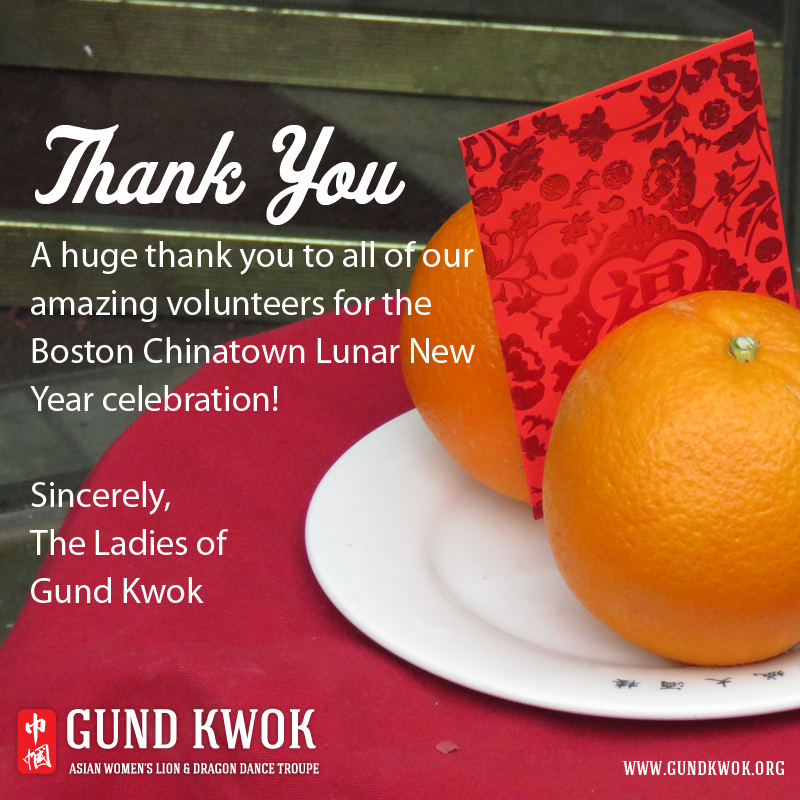 We’d like to thank our amazing volunteers for making this year’s Boston Chinatown Lunar New Year Celebration a success! From holding flags to dropping lion heads & a dragon off to going to all the shops so that they’d be ready for us to steering the drum cart to making sure our supply cart was stocked to crowd control and to everything else in between — we THANK YOU! 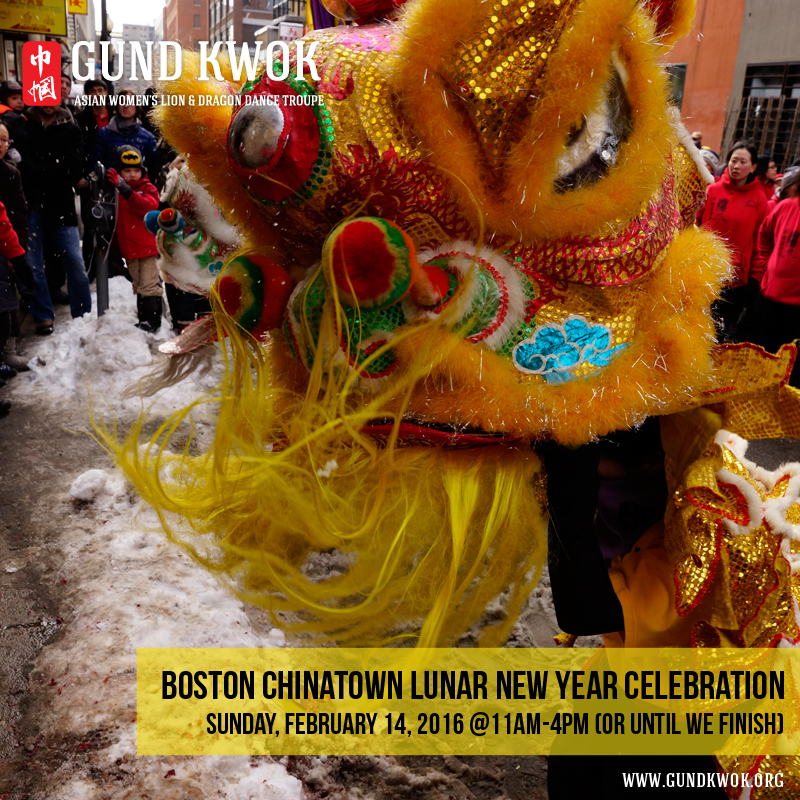 Rescheduled Boston Chinatown Lunar New Year Lion Dance Parade for Sunday, FEB 21 @ 10AM! The arctic temperatures did not cooperate with us last Sunday, but the celebration has been rescheduled for the upcoming Sunday on February 21, 2016 at 10AM! 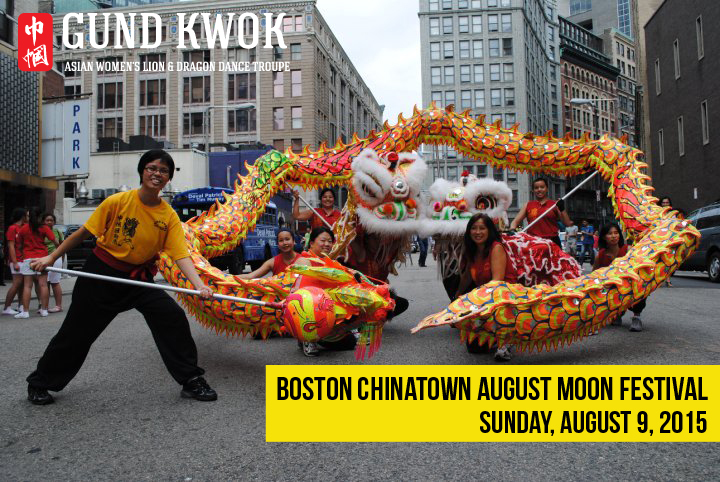 Again, the event will kick off at 1oAM on Harrison Avenue in Boston Chinatown (near Kaze Shabu Shabu, Cha Time, Beard Papa’s, and Asian Garden Restaurant) with stage performances. 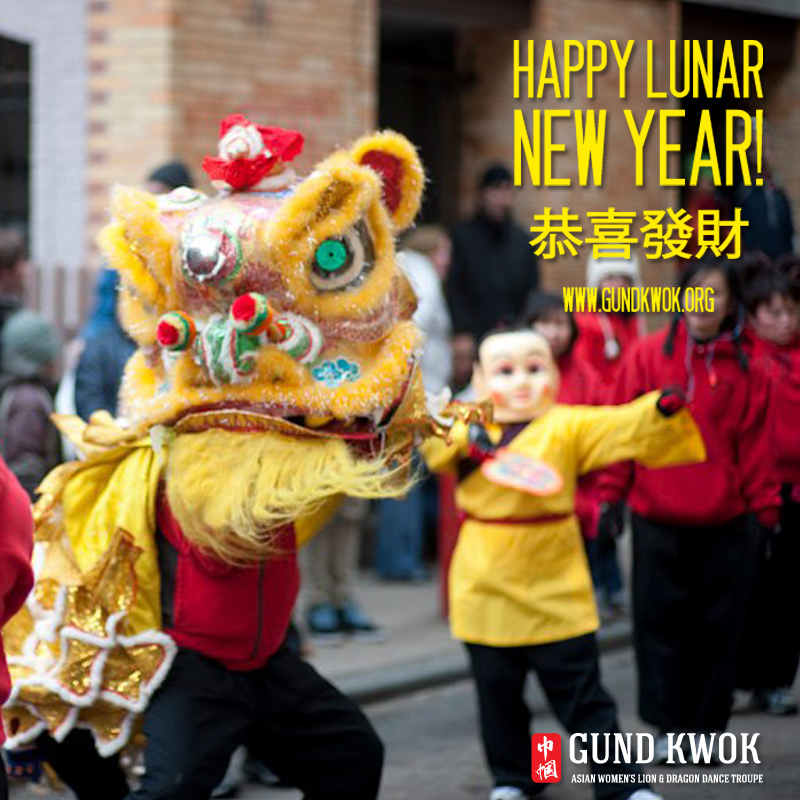 Lion dancers will then go around with their troupes to all the shops and restaurants blessing them and bringing good fortune for the new year. If you’re interested in volunteering, please sign up at http://gundkwok.org/volunteer/. Follow us on Facebook or Twitter to get the latest information! 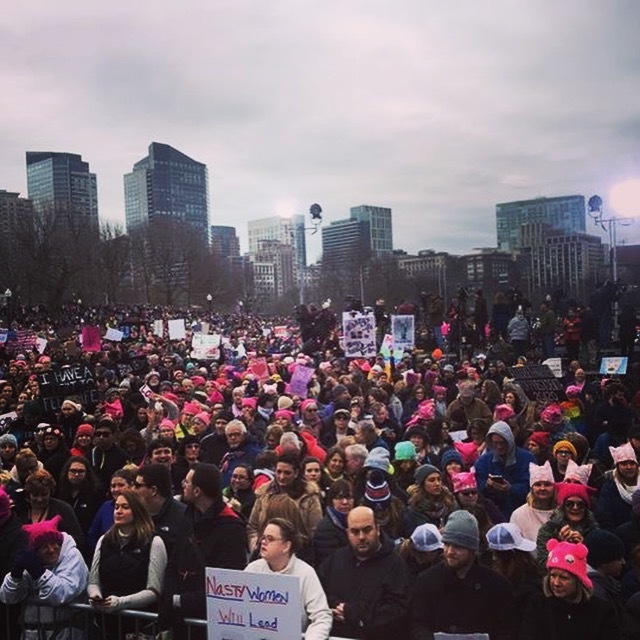 See you SUNDAY, FEB 21 at 10AM! **UPDATE** Due to extreme cold weather, the event has been cancelled and will be re-scheduled. We will keep you updated! 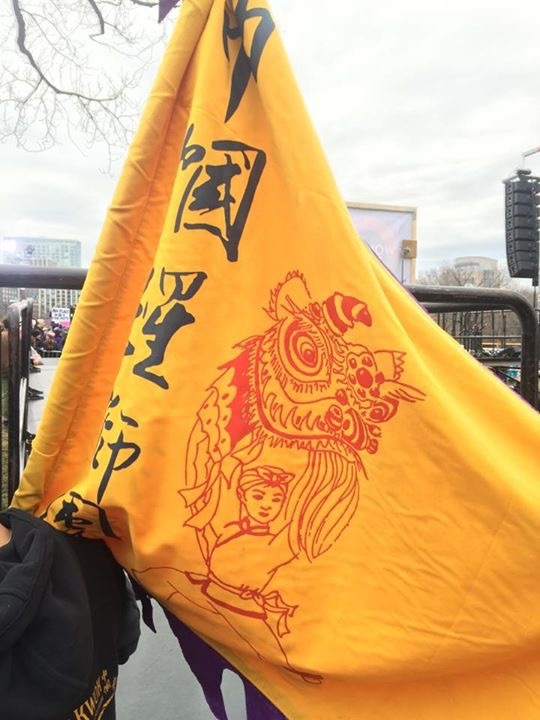 You can never predict what Mother Nature is going to throw at you when the Boston Chinatown Lunar New Year Lion Dance Parade arrives. Like, that year it snowed and we lion danced on regardless. Now, we’re expecting temperatures that will be 20-30 below zero for Sunday, February 14. I guess you can add this to the list of assorted weather elements we’ve lion and dragon danced in. If you should be so brave as to come out to watch us, please use caution! A wind chill warning is in effect from 4PM Saturday until noon on Sunday. Wind chills will be between 20 and 30 below zero with temperatures falling to 5 below zero Saturday night into Sunday morning. Outdoor exposure should be limited. We’re going to have our heat tech, thermals, hats, gloves, face masks, hand/foot warmers at the ready to get us and our amazing volunteers through this arctic blast of weather. 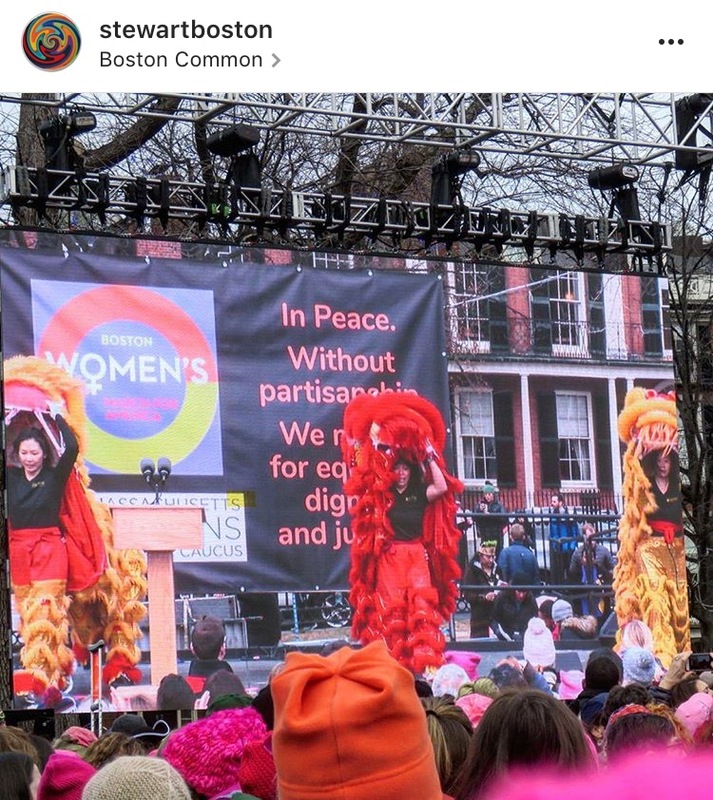 The event will kick off at 11AM on Harrison Avenue in Boston Chinatown (near Kaze Shabu Shabu, Cha Time, Beard Papa’s, and Asian Garden Restaurant) with stage performances. Lion dancers will then go around with their troupes to all the shops and restaurants blessing them and bringing good fortune for the new year. It’s going to be interesting and definitely memorable. Wishing everyone a happy, healthy & prosperous new year! 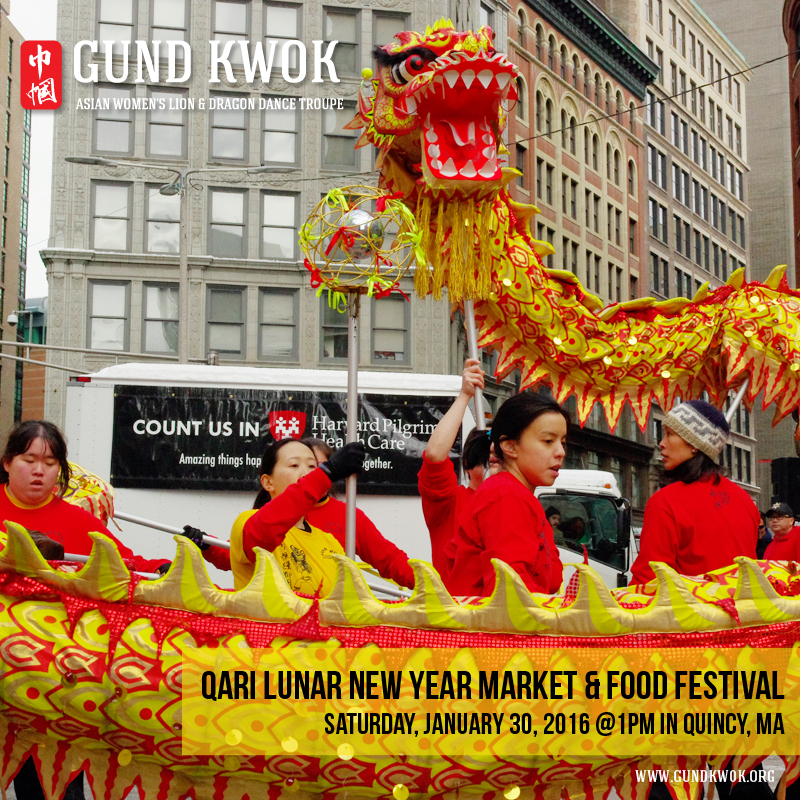 The GK Dragonettes will take the stage at 1PM on Saturday, January 30th at North Quincy High School in Quincy, MA to celebrate the Lunar New Year. This year’s event still includes free live entertainment, along with a new karaoke session featuring a DJ in the auditorium. There will be a New Year market inspired by the night markets found in Asia, which will feature retail vendors selling traditional goods for New Year and crafts from local artists and businesses. The event is FREE and open to the public from 1PM-7PM. For more information, check Quincy Asian Resource for all the latest updates! 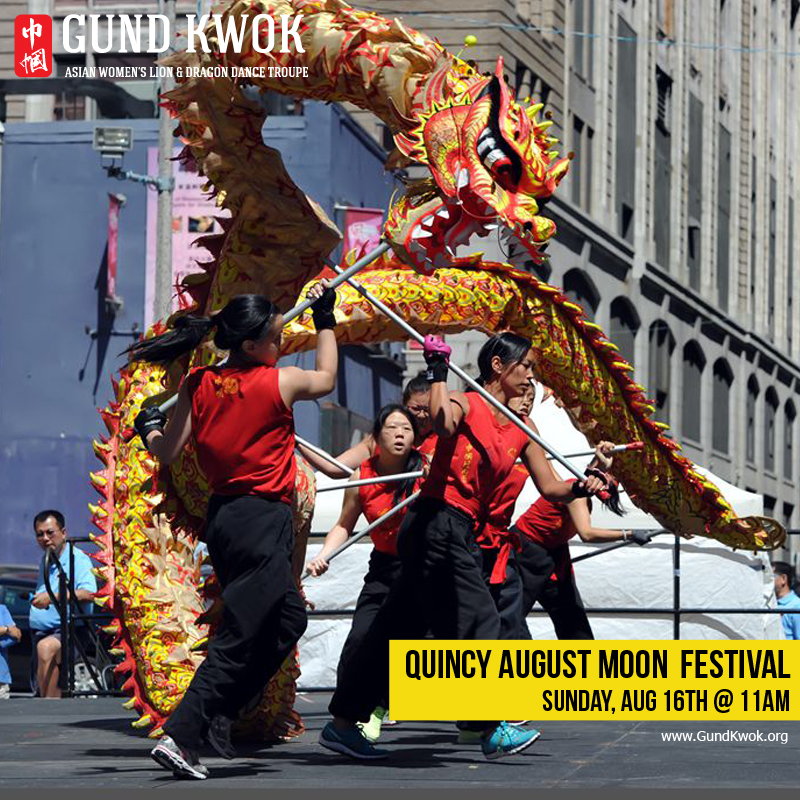 The GK Dragonettes will take the stage at 11AM on Sunday, August 16th on Hancock Street in Quincy Center! 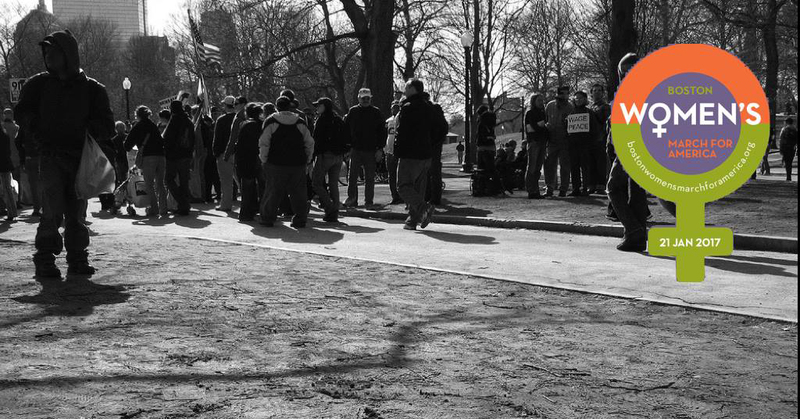 For more information, check out the Quincy Asian Resources, Inc. Facebook page for all the latest updates! Here’s a little bit of a Boston history lesson. 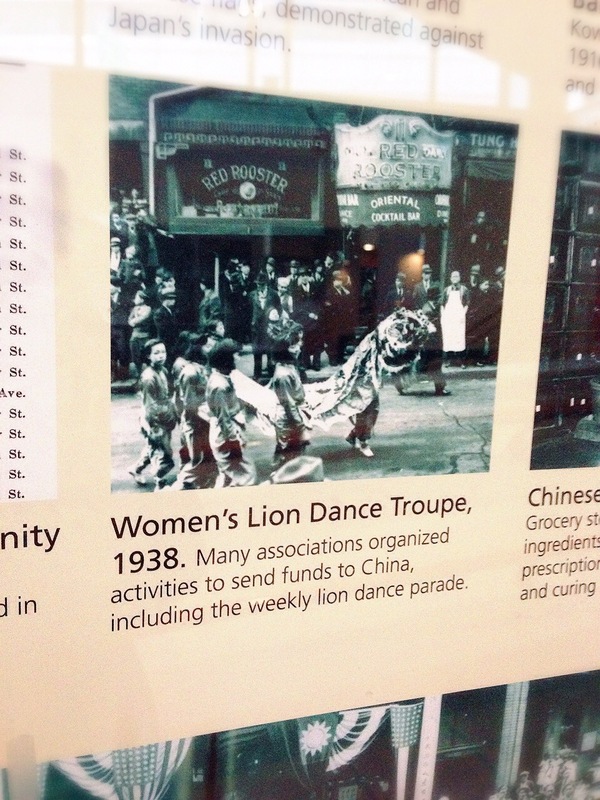 Did you know that the first women’s lion dance troupe in Boston was formed in 1938? We learned about this recently thanks to the Chinese Historical Society of New England (CHSNE), which shares the same building as our practice space in the China Trade Center. For the past few weeks, CHSNE have put up a wonderful banner display and posters illustrating the timeline of the history of Boston’s Chinatown. 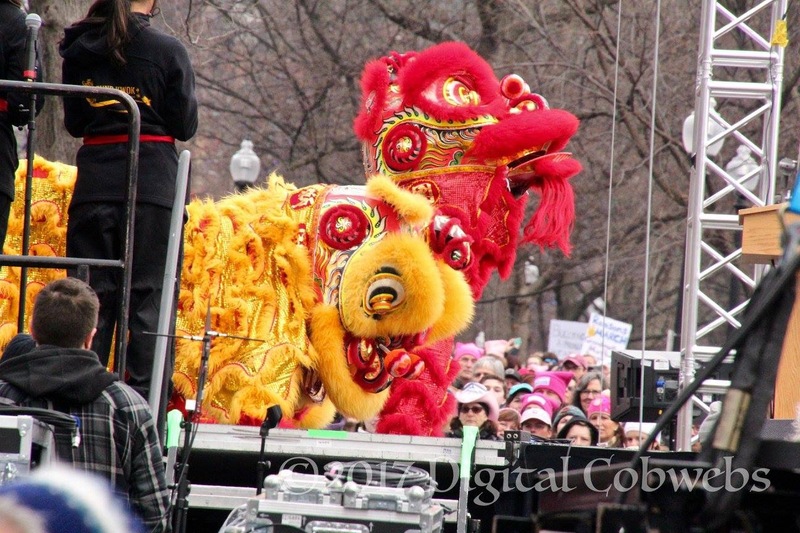 The women’s lion dance troupe fact definitely caught our attention. 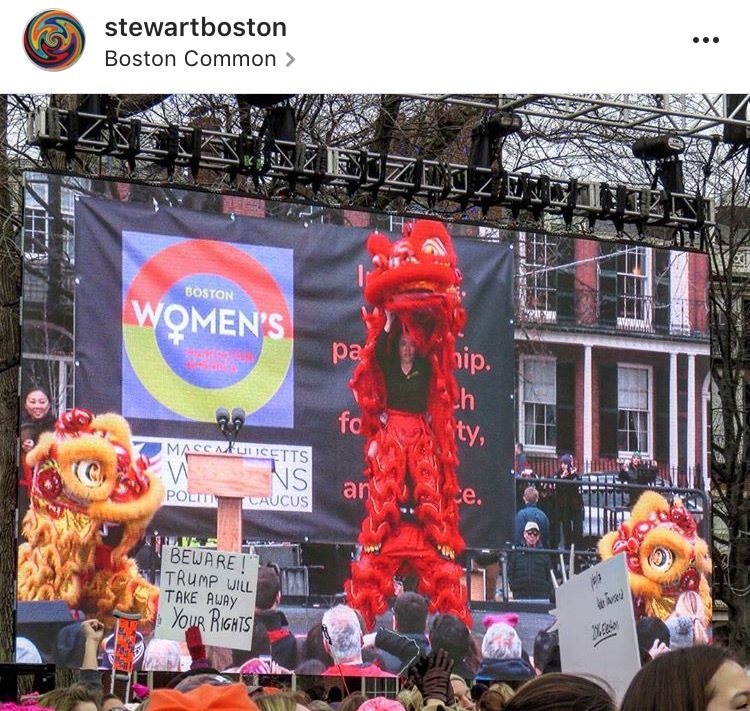 Boston’s first women’s lion dance troupe was organized to participate in fund-raising from the Chinese community to assist China in its defense during the Sino-Japanese War. The entire troupe consisted of eight girls, most of whom were only 11-12 years old. 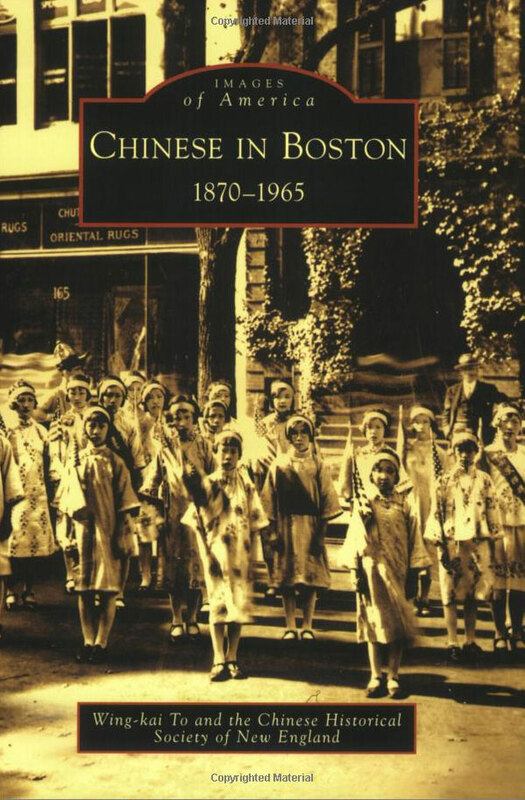 To learn more, visit the CHSNE website to schedule a visit and/or tour OR check out their book Chinese in Boston, 1870-1965 — you can preview a sample of the book here. Check out the GK Cubs during their lion dance performance at the Boston Chinatown Neighborhood Center New Year's Banquet! ‘Like’ Us on Facebook for the latest news! 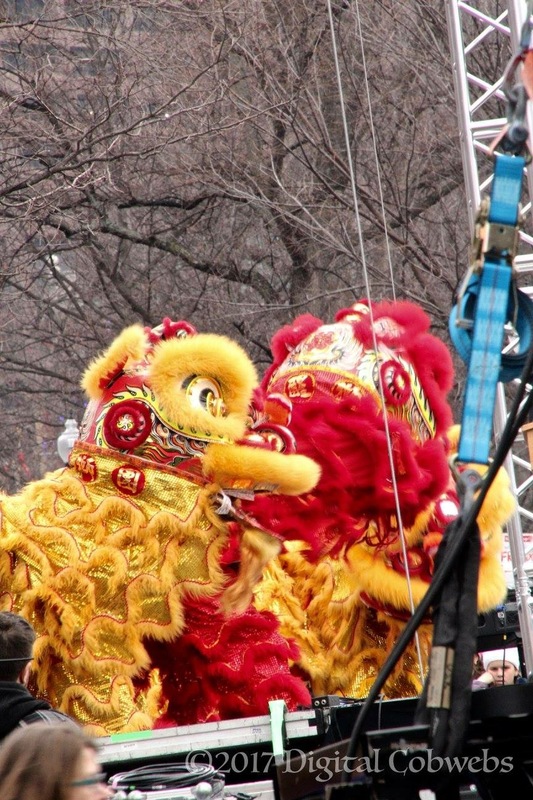 The GK Lion and Cubs Team will be performing at BCNC’s Annual New Year Banquet on Friday, March 6th! 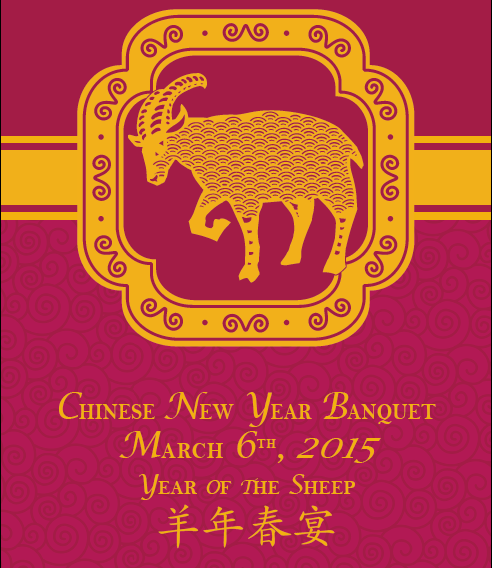 The Boston Chinatown Neighborhood Center, Inc. (BCNC) invites you to join us for our annual Chinese New Year Banquet on Friday, March 6, 2015 at the Empire Garden Restaurant in Chinatown. We will celebrate the Year of the Sheep with good fortune and prosperity. The BCNC Chinese New Year banquet is an annual sold-out event and one of the largest community celebrations in Chinatown, with 600 guests in attendance. This year, we will present the Friends of BCNC Award to Renee Inomata and Paul Lee, and the Amelia Peabody Foundation. The banquet also serves as the biggest fundraiser for BCNC, raising much needed funds to provide essential services to 2,000 children, youth and adults a year. BCNC’s banquet leverages great visibility and showcases your philanthropic partnership with the Asian community. The banquet includes a wine and dim-sum reception, a traditional dinner, a live auction, and a silent auction. 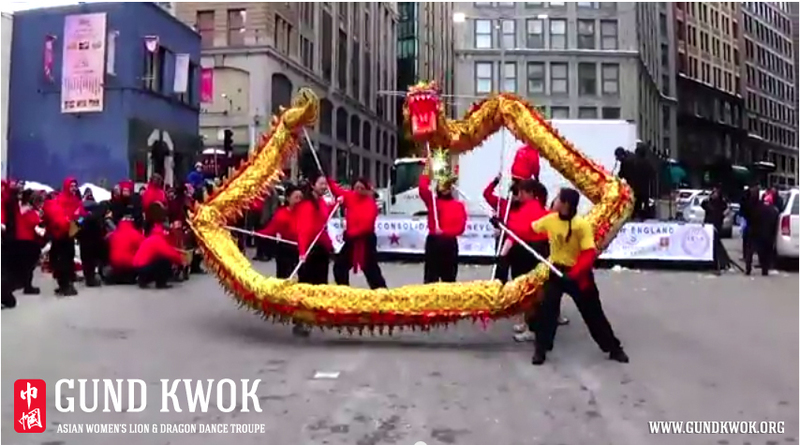 Here’s this past Sunday’s Lion & Dragon Dance stage performances. 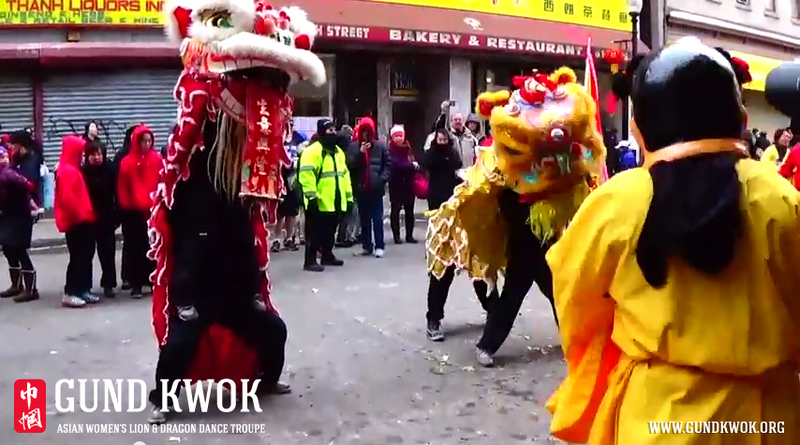 This kicked off our day-long lion dance parading through the streets of Chinatown.